Oh man, I’ve been had. 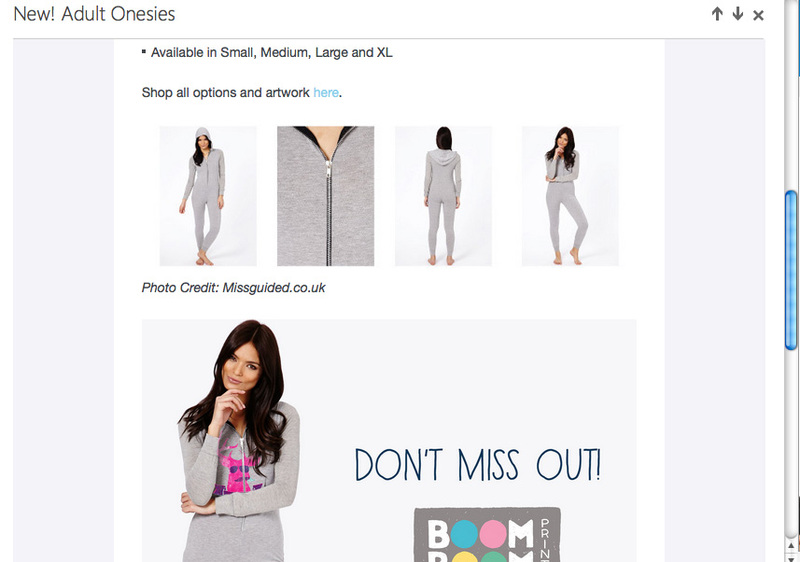 I received an email on April Fool’s Day regarding the addition of adult onesies to the Boom Boom Prints line of products. Unfortunately, I only got around to opening it today: well past the window of my prankster-paranoia. Screenshot of the e-mail notification. Did I think they would look good on me? No. Did they look practical? Nuh-uh. Was I excited to wear one anyway? Heck yeah! It had a hoodie and no footies. It was built for me! The upside of this little prank was that I was motivated enough to add the Birthday Llama to the No Mine! Studios line for kids, maternity wear, stationery, and more. It also reminded me to check the Studio email in a more timely fashion, regardless of what else is happening in my life. Well played, Boom Boom Prints, well played. You can check out the full range of designs for sale and links to authorized vendors on the No Mine! Studios Shop page. Next ›New Vendor & New Gear!